One of the most critical factors in construction is keeping a project on track. Too often, inaccuracies caused by human error, lack of organization and inefficiencies in the process can quickly derail a project. Suddenly, a construction project that had been moving along smoothly becomes a challenge to keep on schedule. 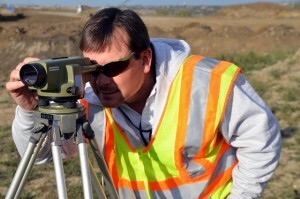 Regardless of whether you are in the oil or gas industry surveying a prospective new site, or in some other field embarking on a construction project, the last thing you want to worry about is reliance on inaccurate information. Mistakes along the way, like reliance on an inaccurate as-built survey, can cost the entire project in both time and money—and make it difficult to get back on track with either. As-built surveys are critical to ensure construction projects proceed safely and accurately, but even minor errors can add weeks to the production schedule. While it may seem there is not much a project manager can do to assure accuracy of a survey or the process that follows, two technologies available today can give a boost to confidence and put project managers back in the driver’s seat when it comes to project progress. One of the ways new technologies are helping to improve project accuracy is through 3D laser scanning. Rather than having to move from point to point on a job site to gather all the necessary information needed to complete the as-built survey, this technology enables surveyors to use terrestrial laser scanning to compile all the information they need. From there, they are able to build accurate 3D models that provide the necessary detail to complete their work. Turnaround time is shaved from a few weeks to a few days, but just as critical, human error is nearly eliminated from the equation. Also known as LiDAR data collection, terrestrial laser scanning works by bouncing laser beams off the area to be surveyed. The scanner records a point every place the laser hits a surface. The result is an enormous “point cloud” made of millions of survey grade points. The individual points can then be connected to create a detailed representation of the job site environment. The second piece of technology providing improved accuracy to the construction process is a cloud based project management suite. A project management suite serves as a central hub for your entire project. Anyone involved in the project and holding access to the management suite can view, upload and download the most current versions of critical project documents. Gone are the days of wondering whether or not you have the most current information relating to the project. Instead, you and the other project stakeholders can feel confident you are looking at the most recent, most accurate documents available. Rather than keeping track of document versions, the project management suite keeps track of those details for you. The results are accurate, up-to-date materials that all parties can access, even from a mobile device out on the job site. To learn how these new technologies from Landpoint can improve accuracy of your as-built surveys and keep your project on track afterward, contact us today.